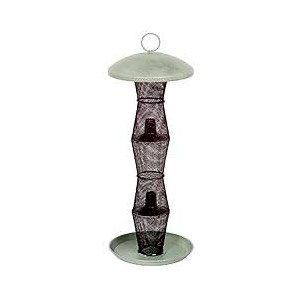 2-1/2in diameter, 13in metal mesh, multi port peanut feeder. Durable metal mesh. Metal cap and base. Fully assembled. Black. 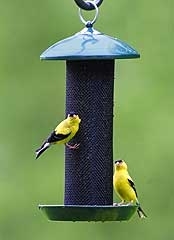 Designed to cater to a variety of finches that can cling to the screen or perch on the tray. 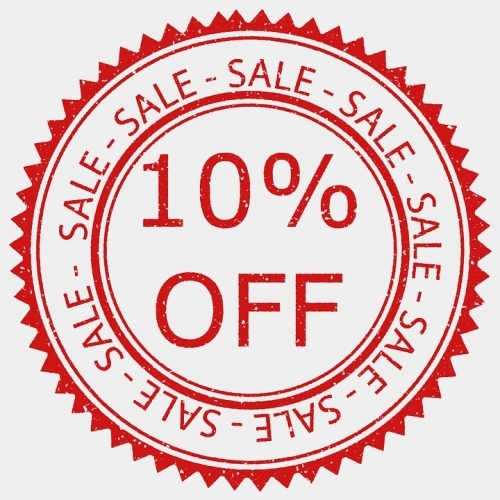 Beautiful weathered bronze powder-coat finish is durable and will look great in your backyard. 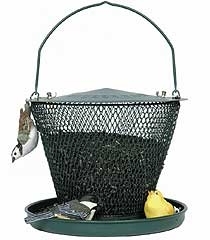 This feeder features a large hanging ring that is compatible with any Stokes Select accessory item. Specially designed seed diverter ensures that seed will move to feeding areas keeping our seed dry and your hungry finches happy. 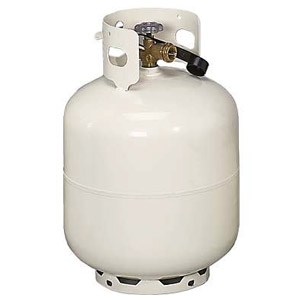 1 lb capacity. 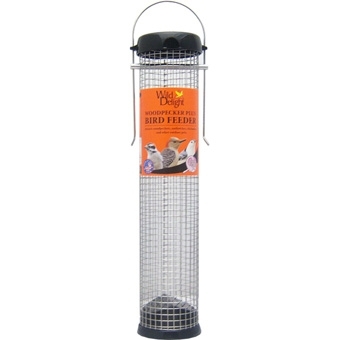 Screen feeder holds 3.5qt of mixed seed or black oil sunflower - easy twist off top and base for filling and cleaning of feeder - built-in drainage holes and seed diverter help to keep seed fresh and dry. Two large feeding compartments can hold different types of seed. Built-in drainage holes keep the seed fresh and dry. Seed diverter helps to keep seed fresh and moves the seed into feeding areas. 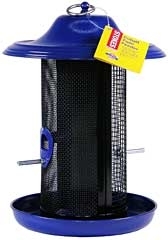 Mini Seed Screen feeder holds 1.3qt of mixed seed or black oil sunflower - easy twist off top and base for filling and cleaning of feeder - built-in drainage holes and seed diverter help to keep seed fresh and dry. Little-Bit Feeders feature twist-off cover and base for quick and thorough cleaning and easy filling. Holds 0.5 quarts of seed. A cozy trough with a broad, protective overhang also allows birds to feed through the steel mesh. It holds 2.5 pounds of black oil sunflower seeds or you can mix in some safflower if you prefer, it won&#39;t be wasted. No assembly required, just hang and fill. 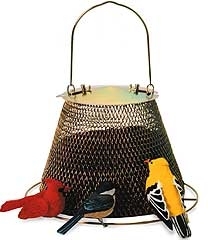 Years ago No/No designed the bird feeder of our dreams: All metal. No wood or plastic. Study, yet beautiful. Now we've slightly downsized our original No/No cone shape and multiplied the height to five tiers - for more feeding space than ever! 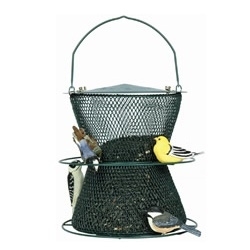 This 20 inch high feeder includes two perching rings plus a perching tray to attract all types of wild birds. 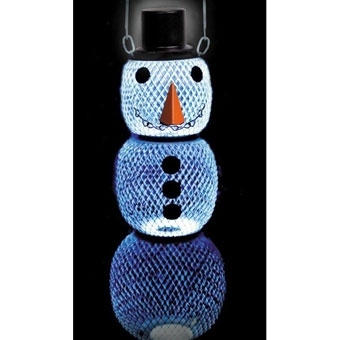 The snowmans smile is irresistible and this feeder brings lots a smiles to your bird feeding experience. The solar snowman captures solar energy through sensors in the top hat which powers LED lights to illuminate the feeder at night. No assembly required, just fill and hang. 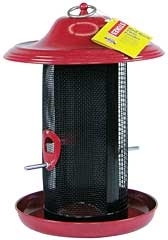 Dispenses black oil sunflower seed and stands 15 inches high. The newest bird feeder in the No/No line. The Multi Seed Feeder is made for mixed seed. 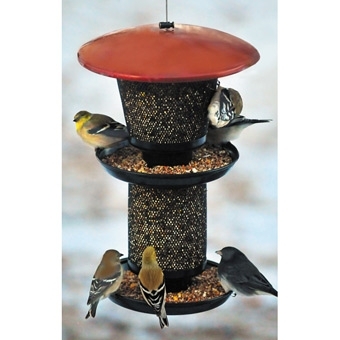 The Multi Seed feeder combines stylish design with the best features available today. Our patented feeding system with baffle dispenses seed evenly through mesh sides and in two trays. All metal rigid feeder is brick red and black to make this a standout. 14 inch in height it has a 4lb seed capacity. 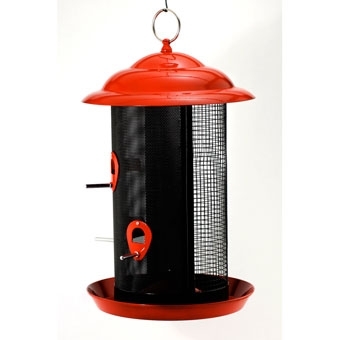 Each opening in the metal mesh sidewalls becomes a seed station for birds using the no/no finch feeder. The largest feeding surface in the bird feeder industry. Our unique baffle device helps keep feed at upper levels instead of letting them run dry as birds deplete the seed. Holds approx. 2 pounds of nyjer seed. 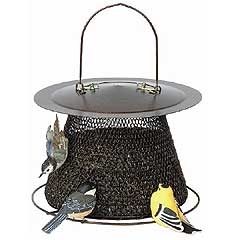 The No-No Bird Feeder (No Wood, No Plastic) is a collapsible wire basket feeder that will last for years and is ideal for feeding black oil sunflower seeds. 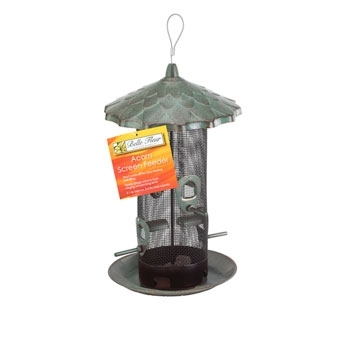 Feeds 10 to 15 birds at once, and attracts both clinging and perching birds. 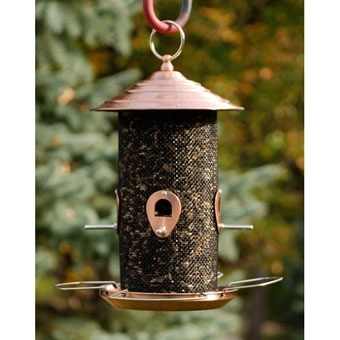 Features an innovative design that is ideal for feeding a flock of your feathered friends. 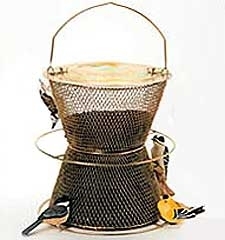 This wire basket bird feeder features an entirely metal construction; built with NO wood and NO plastic so that it will faithfully serve your birds season after season. No Wood and No Plastic. This unique design features a sturdy trough-type feeder that some birds prefer - with drains to shunt away moisture from rain or snow. Holds over 2.5 pounds of seeds. Beautiful finish shines in any back yard or patio setting. No Wood and No Plastic. Huge capacity, holds over 6 pounds of black oil sunflower seeds. Fewer refills means more time to enjoy the show. 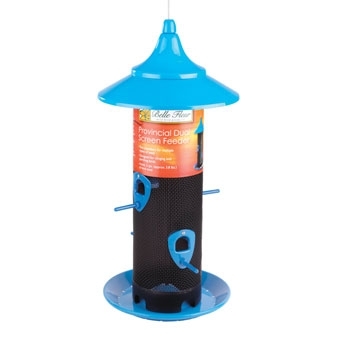 Feeds 10 to 15 birds at a time and comes ready to hang, fill and enjoy. No Wood and No Plastic. 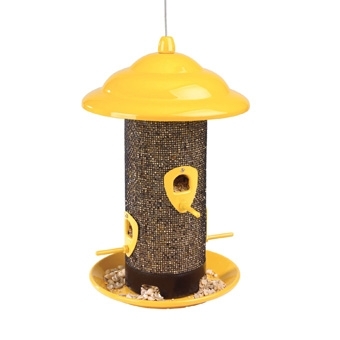 Built for the serious birder, this new design holds over 6 pounds of black oil sunflower seeds. Double-tiered perching rings create lots of room for 15 or more birds. Comes fully assembled. 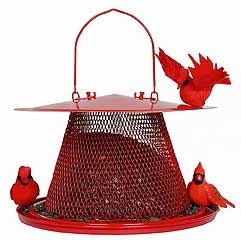 The Brick Red Metal Large Mesh Combo Screen Feeder attracts more birds by allowing you to use two kinds of seed at the same time. Easy to clean and fill. The 12in Brushed Copper Screen Feeder is ready to hang, no assembly required. It is a 4 port multi-seed screen tube feeder. Capacity: 3 lbs. Roof twists off for easy cleaning and filling. Feeder design attracts both clinging and perching birds. Large opening for filling feeder with a favorite bird seed mix to attract songbirds. Holds 2.1 quarts (approx. 2.6 lbs) of seed. Two chambers for multiple types of seed. Designed for clinging and perching birds. Holds 3 qts. of bird seed. Locking roof secures seed in feeder and allows for easy filling and cleaning. Large opening for filling feeder with a favorite bird seed mix to attract songbirds. Beautiful design has a large roof which protects the seed and the birds while they feed. It has multiple portals and perches for maximum bird viewing.